Two years after the original Nokia 105, Microsoft updates this budget phone with room for 2000 contacts, improved call quality, also adding a dual SIM version. Microsoft released the original Nokia 105 back in May 2013 and sold over 80 million units ever since. 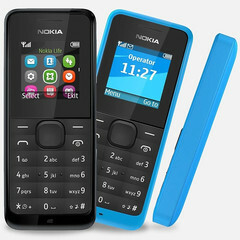 Earlier today, the Redmond giant announced a new Nokia 105, also available in a Dual SIM variant. This cheap handset targets first-time mobile phone buyers, but also those looking for a backup phone that offers long battery life and a sturdy design without breaking the bank. Microsoft Nokia 105 and Nokia 105 Dual SIM will go on sale later this month "in select markets" for an estimated price of just $20 USD before taxes and subsidies. Availability and pricing details should be announced locally prior to launch. REDMOND, Wash. — June 3, 2015 — Microsoft Corp. on Wednesday announced the new Nokia 105 and Nokia 105 Dual SIM. Aimed at first-time mobile phone buyers, as well as people looking for a reliable backup device for their smartphone, the new Nokia 105 will enable more people to have a voice and experience the potentially life-changing benefits that a mobile phone can offer. The original Nokia 105 has sold more than 80 million units to date, introducing people from across the globe to mobile experiences. Connect with people and businesses without great expense. Keep a backup handy: Low price point, long battery life and ease of use make the new Nokia 105 an ideal companion device for existing smartphone users or people on their travels. The new Nokia 105 and Nokia 105 Dual SIM will be available in cyan, white and black2 for an estimated retail price of $20 before taxes and subsidies3 and will begin rolling out in select markets starting in June 2015. The Microsoft Devices Group includes award-winning hardware used by over a billion people around the world, including Lumia smartphones, Nokia ultra-affordable feature phones, Xbox hardware, Surface and Surface Hub, Microsoft Band, and HoloLens. 3 Pricing for the new Nokia 105 and Nokia 105 Dual SIM will vary by market and operator; estimated retail price will be approximately $20 before taxes and subsidies.